I just heard the garbage truck drive up to the curb outside my house and make quick work of the huge mound of trash bags I piled there last night---trash bags filled with discarded wrapping paper, boxes and of course the remains of several holiday dinners. I have begun eyeing the boxes and storage containers within which my Christmas decorations will soon be placed for another year. It's a job I do not relish. Here's a thought that may have crossed your mind once or twice as well: Maybe we could just keep celebrating Christmas for a while. Do we really have to rush away from it as quickly as we rushed toward it? What happened to the wonder that we all felt on Christmas Eve? Where's the unexpectedness of the Season of Expectation that we call Advent? Is it really all lost in a pile of decorations waiting to be put away? A stack of bills that will need to be paid? What if we were called to something different? The passage of Scripture that I am preaching on this week is from Luke 2:39-52, the story of how a very young Jesus got separated from his parents on a trip to Jerusalem and they later found him hanging with the premier religious scholars of the day, holding his own as a twelve-year old boy. 39 When Joseph and Mary had done everything required by the Law of the Lord, they returned to Galilee to their own town of Nazareth. 40 And the child grew and became strong; he was filled with wisdom, and the grace of God was on him. 41 Every year Jesus’ parents went to Jerusalem for the Festival of the Passover. 42 When he was twelve years old, they went up to the festival, according to the custom. 43 After the festival was over, while his parents were returning home, the boy Jesus stayed behind in Jerusalem, but they were unaware of it. 44 Thinking he was in their company, they traveled on for a day. Then they began looking for him among their relatives and friends. 45 When they did not find him, they went back to Jerusalem to look for him. 46 After three days they found him in the temple courts, sitting among the teachers, listening to them and asking them questions. 47 Everyone who heard him was amazed at his understanding and his answers. 48 When his parents saw him, they were astonished. His mother said to him, “Son, why have you treated us like this? Your father and I have been anxiously searching for you.” 49 “Why were you searching for me?” he asked. “Didn’t you know I had to be in my Father’s house?”[a] 50 But they did not understand what he was saying to them. 51 Then he went down to Nazareth with them and was obedient to them. But his mother treasured all these things in her heart. 52 And Jesus grew in wisdom and stature, and in favor with God and man. What does this passage teach us about Jesus and his family? First, we know that they were faithful Jews. The first line indicates that Jesus' early childhood was marked by his parents adhering to what was required by Jewish law regarding the rearing of children particularly boys. We also know that they faithfully travelled as a family to Jerusalem each year to worship at the Temple. This was something that most people of their social class from the Galilee seldom did. And if they did travel to Jerusalem, it was something that typically only the men would do. Jesus' whole family went. This tells us that they were tight knit as a family, they travelled together. Now, when I say "together" I mean that they travelled in a group---obviously the story indicates that Mary and Joseph assumed that Jesus was somewhere in the group when they left the city and travelled for about a day. Which also lets us know that they were part of a larger community that they undoubtedly regarded as "family" or as close to family as you can get. It's interesting to me to think of Jesus in this kind of environment because it's easy for us to imagine what that would have been like. But as humanizing as all of this is, there is no escaping the extraordinary things that we discover about Jesus from this great story. When his parents finally find him after frantically re-tracing their steps, the discover him at the feet of the rabbis in the Temple, blowing their minds with how much he knows about the Torah. I should say something here about how Mary and Joseph must have felt. I've lost a kid or two in my day---including once at a huge conference at Tropicana Field when my then 5-year old oldest son got separated from us in a crowd and we didn't realize it for a while. They must have been beside themselves with worry. At any rate, Jesus is sitting with the rabbis, asking questions and trying to learn all that he could. Because of what we know about Jewish tradition, we know what Jesus would have had to know in order to ask the kinds of questions the rabbis would have been astounded by from a young boy. He must have had the entire Torah memorized, and probably had some of the Prophets and Psalms as well. I know what you're thinking---how hard is it to memorize it if you're God, and you sort of dictated it. I feel you. We also know that Jesus understood his purpose and his priorities. He knew that there was something special that was ahead of him, and he also knew that his "Father's business" was truly the focus of his entire life. But we also know that he was an obedient and faithful son because he dutifully returned home with his parents when they came. I am sure that he saw how freaked out they were when they found him and discovered what was going on. It says that Mary treasured or pondered these things in her heart, which echoes what we see written in the last line of the Nativity narrative. I bet she did. I bet she pondered a WHOLE BUNCH OF STUFF. So what can we take away from this story? The fact that these are generally the same top ten resolutions each and every year tells us a lot about who we are as people. I have a question, though. What's missing from the list? Honestly, it's the same thing that's missing from most of our lists. In addition to giving us glimpses into his life and his extraordinary power, this little story teaches us to focus on following Christ. We should be focused on following Christ and not focused on ourselves, which is easy to do as the list of resolutions above indicates. And not family, which is sort of counter-intuitive, isn't it? I mean how many times have you been encouraged to spend less time at work, out with the boys, pursuing a hobby, etc. and spend more time with your family? Probably a lot if you are like most of us. We should also not be focused on our culture, with all of its demands and illusions. 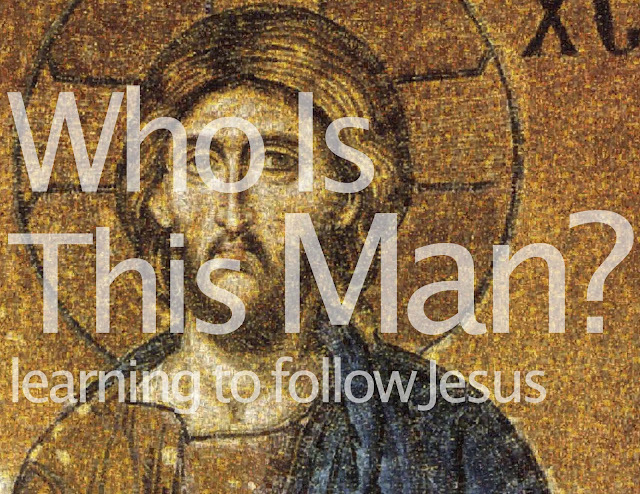 Jesus offers to us a radical notion of discipleship that is difficult for us to hear and to heed. Maybe some of you at this point are pushing back against it pretty hard. You might have no issues with not focusing on culture---or at least the concept. You may totally get how you should not be focused on yourself. But where you feel yourself pulling away from this whole thing is when we lift up the idea that a true disciple of Jesus (according to his example) is quite willing to put family below Christ. Here's the big takeaway from this story. When your focus is on God, you are able to see more clearly how to properly focus on everything else. For the Christian, we may as well just say "focus on Jesus," since we believe that God actually became one of us to save all of us, and the form he took was the man Jesus Christ. Knowing who Jesus is can change your priorities. So here's how this works. When your focus is on Jesus, you soon realize that your priorities change. You want to spend time with your family rather than work all of the time. You don't want to fall into cultural traps of idolatry and deception. When Jesus is first in your life, all of those resolutions that you never thought for a minute you'd be able to keep are suddenly a lot more doable. Putting Jesus first can save your marriage. When you are willing to live like Jesus, sacrifice like Jesus and love like Jesus your spouse reaps the benefit. Putting Jesus first can rearrange your ideas about fitness. When you are dedicated to being a sold-out disciple of Christ, you realize that things like gluttony, self-disrespect, addictive behavior and the like are both dishonoring to his name and lousy witnesses to his redeeming power. Putting Jesus first can help get you out of debt. When you begin to follow Jesus' teachings about money and possessions, you begin to realize how important it is to be a good steward of what you have been given. You feeling me at all? Knowing who Jesus is can change your priorities in this coming year. Get to know him. Put him at the top of your new year's resolutions. Hold on to your wonder. Let yourself be surprised by the difference Jesus can make in your life.